Since as early as the 1800’s Big Food has socially engineered the perceptions and expectations of U.S. consumers. When it comes to the colors of mass-produced foods, historian and author Ai Hisano directs her attention toward the period from roughly 1870 to 1940, when artificial coloring went from occasional gimmick to ‘food-marketing norm’. Over the past 150 years, food companies and marketers in other parts of the world have taken eating in a more visually thrilling (if a little disorienting) direction. 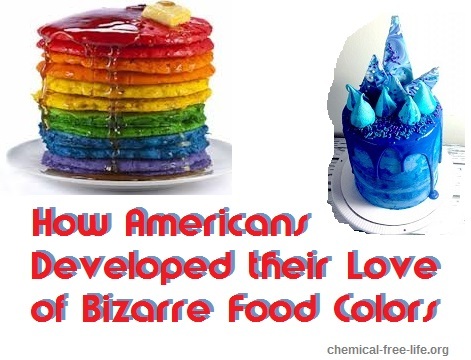 They have used dyes to alter mass-produced foods—sometimes to make them less “natural”-looking (see: cakes with bright-blue icing), sometimes to make them more “natural”-looking (pickles made greener to fit with consumers’ expectations). Both intentions are, upon further inspection, sort of strange. The first one is odd because it’s not entirely clear, even to researchers, why anything with some abnormally bright colors would be appetizing at all, given that when, say, the color blue appears in nature, it’s often a sign of spoilage or poison. And the second is a paradox: How could a food be made to look “more natural” by virtue of artificial additives? Starting in early 19th century, it became increasingly more common for businesses to manipulate foods to give them a standardized, recognizable appearance: Bakers would whiten bread with chalk, dairy farmers would add a lead compound to milk to make it seem thicker, and, later in the century, meatpackers began to inject red dye into cuts to make them look fresher. (As unhealthy as these “ingredients” sound, the bigger risk was that they were masking mold or spoilage that could sicken or kill.) But one thing that made the revolution Hisano documents possible was the discovery, in the 1850s, of a vivid magenta dye made from the liquid left over after processing coal—a repulsive-sounding (but usually safe*) additive that could be synthesized on the scale necessary for mass-produced foods. Nowadays, manipulating foods’ colors is the norm (and much safer)*, and even a consumer expectation. Grocery stores know that only pristine-looking apples sell—hence the shiny wax coating that growers apply before shipping. Never mind that more “natural” apples, the ones straight from the orchard, vary in color and often have dents and bruises. See our video on Yellow Dye 5 here and see some of our other vids here. See additional research sources on food dyes here.